Let’s first talk about the example we have above, so we’re happy with Folder 1, how do I go and make sure every sub-folder/file will inherit the same permissions and will also remove any addition and reset the inheritance from the parent? The specific command above will reset (/Reset) permissions recursively (/T) and ignore any error (/C). IMPORTANT: The above command will work, but on a large folder with a ton of files and folders, you’ll end up having a problem with files that are directly located under Folder1: in fact, because of the /T switch to go recursively through every file, icacls will try to locate files named the same way and take actions against them. This is true for our Folder1\File1.txt in the example above. The /T command will make it search and take action against every file named File1.txt under Folder1. Of course, if you don’t have any file under the parent folder, than you won’t have that problem, but, we want a solution that is capable of working in scenarios where there are files under the parent folder and that will make the least of the effort in order to save time on large folders with millions of files. So here’s when I thought of splitting the operations in two cores, one for the files located under the parent folder and one for the folders. We need to run through every file under the parent folder and reset permissions for these, without the /T option. 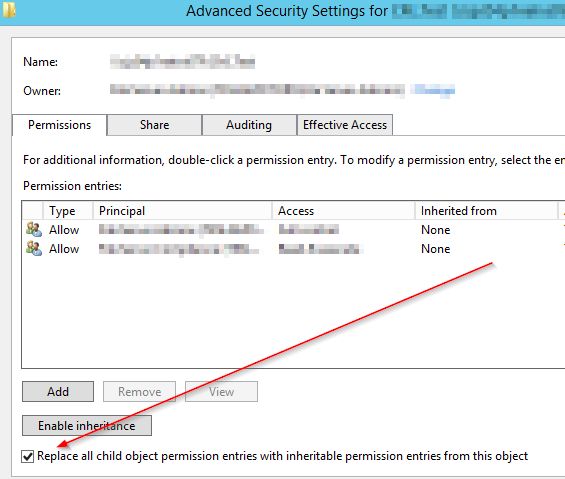 We need to run through every folder under the parent folder and reset permissions for these, with the /T option. Now that I’ve presented you with some more info, I can show you the basic script I built, which of course you can take and edit to make more robust (this is just an example). Grab a list of $SubFiles right under $Path and, if there’s any, start a job ($Job) to go and reset permissions for every of them with icacls, without using the /T option. I leveraged start-job to be safe in cases where I could have a parent folder ($Path) with a lot of files located right under it. This will start a job and it’ll work in the background. Normally though, we don’t have many files, so a process to go through each of them should be enough. (You may switch to using a process instead, see how I handled the subfolders below). Grab a list of $SubFolders and, if there’s any, start an icacl process (and store each process info under $Processes) for each of them. Why a process and not a job this time? Because folders are containers and will contain a lot more files and subfolders. This means that if I was to start a job for every direct sub-folder, then the job would trigger icacls taking more memory than it should. Instead we start right away an icacl process and let it go on its own. If there was any $SubFile, wait for the job ($Job) to finish. If there was any $SubFolder, wait for every single process (in $Processes) to finish. If there was any fatal error in launching the job/processes, it’d be captured in the Try/Catch. #Now go through each $Path's direct folder (if there's any) and start a process to reset the permissions, for each folder. Write-Host "The script has completed resetting permissions under $($Path)." Throw "There was an error during the script: $($ErrorMessage)"
Of course, use this with caution and test it in a dev environment before using it in production. I won’t be responsible for any issue that you may get from misusing this.